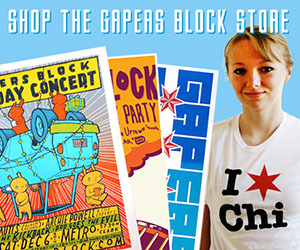 As has been written many times before, Chicago is, at its heart, a jazz and blues town. Delmark Records, along with a very select few independent labels in the city, have taken it upon themselves to keep releasing and promoting jazz and blues with one foot firmly planted in Chicago. 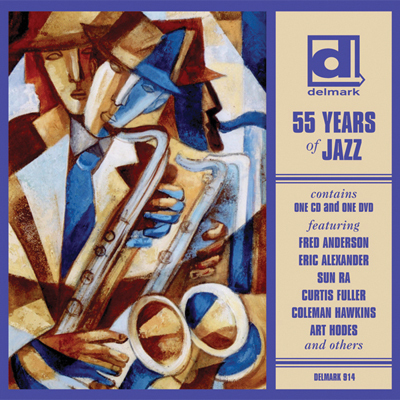 For their 55th anniversary, Delmark has released their 55 Years jazz and blues compilations. Each set is contained on two discs; one a music CD and the other a video DVD. As far as the music CDs go, my buying advice would be like any other compilation album or set. 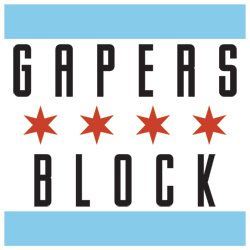 You may like two songs, every other song, or just the last three, but unless you're really hungry for a lot of Chicago-based music of all kinds, you may not like it all. There's experimental jazz, down-home blues, songs to rock out to, and slow and plodding selections. What is most likely to happen is that you can listen to all of the tracks and possibly follow up with the songs and artists you liked. As it stands, this is a good representation of the musical diversity of not only jazz and blues as genres, but of Delmark itself. The DVDs are added bonuses, and add to the total value of the package. Both feature digital transfers of what looks to be videotaped live performances, but the sound quality is pretty decent for the most part. And that's what's most important. The Jazz set of videos were taken at various places around the city, the most notable of which had to be the Ace Hardware store that was once a jazz landmark. You can get a bit of the history and watch the performance here. What I love about the jazz selections is that they focus on the musicians and what they were doing. Some make it look easy, and some are trying to eke every last drop from their instrument, but it's a pleasure to watch. Only thing that wasn't a pleasure to watch was the video effects used on a few videos which only served to detract from the performance. As for the Blues disc, the production quality is about the same as the Jazz one, just without the funky video effects. Blues simply can't be done in a studio; at it's core, someone is telling you a story. And the collection of artists they have videos of are telling you a story, and you really get a feeling for how far showmanship goes in a musical genre like the blues. These men are 50-plus years old, but still exhibit the energy of thirty-somethings. And like jazz, some make it look easy, but it just wouldn't be blues if it looked easy all the time. Some might say that it's rather easy to get the blues, and the hard part is shaking it off. Most of the videos are shot at Chicago blues landmarks like Rosa's and B.L.U.E.S., which lend an intimate feel and a warm-sounding room that couldn't be duplicated at a larger venue. A notable exception is the video for Carey Bell's "Broke and Hungry". With him on harmonica and his son Lurrie on guitar, you can't help but feel the song. And they're sitting on the couch, in his son's home, and he's telling you a story. Carey Bell died two years ago, and the video here serves as a great memory of a man whose life was steeped in the blues. Definitey a highlight, even if you personally haven't been "Broke and Hungry." All told, there are about two hours of material on each set, and well worth checking out if you're a jazz and/or a blues fan who may not be as up on Chicago's place in those genres as you should be. Right about now, it seems that Chicago is an indie-rock type of place, with successes from all over, but labels like Delmark didn't get to be in existence for 55 years for ignoring a rather numerous base of fans of chronologically older fare. 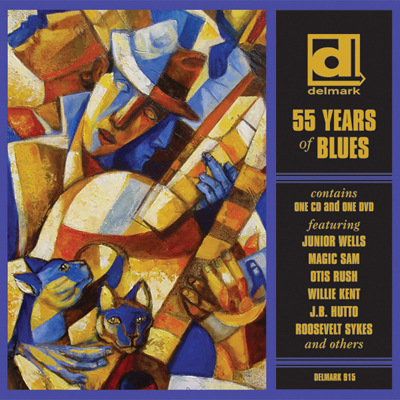 Pick up a copy of the Delmark 55 Years of Blues CD/DVD or the 55 Years of Jazz CD/DVD at your local record store in time for the holidays. We suggest the Jazz Record Mart now located at 27 E. Illinois. Delmark Records hosts a Holiday Blues Party Friday, Dec. 19, at S.P.A.C.E. located at 1245 Chicago Ave. in Evanston. The evening features Delmark Recording Artist Dave Specter and his band with special guest Mark Wydra on vocals and guitar. Additional musicians include Harlan Terson on bass and Howie K (Blue Man Group) on drums. Guy King opens with a solo set. Tickets are $10, available via Ticketweb. A creative trapped in a techie body, Troy Hunter came to Chicago from Southern Cali for proper schooling. More than 10 years, four worn keyboards, and numerous sheets of Bristol paper later, he's still here. He and his wife reside in Edgewater and coordinate activities at UrbanTherapy.